I’ve posted quite a bit lately about my father’s struggle with cancer, and my struggle to deal with it. I’m sad to say that dad’s strength is fading more and more each day, but relieved to share that mine seems to be coming back. In some respects, both are a good thing. In my case, I think having the dissertation done, and being able to share with Dad that his son has finished his Ph.D., is a gigantic weight lifted. (And yes, I know I’m woefully overdue on an update about how all that went.) It was one major source of stress and loss of time that’s now resolved, which of course helps. It’s also been phenomenal having Sal here. I can’t begin to tell you how much of a mental and emotional rock he’s been for me, helping me prioritize, reminding me to take care of myself, and helping me keep things in perspective. He’s also quickly identified the things that neither I nor my dad nor his wife had been making the time to do, and jumping in to take care of those things all around us. He’s been an unstoppable force of calm and support, getting things done, and it’s made a tremendous difference for all of us. 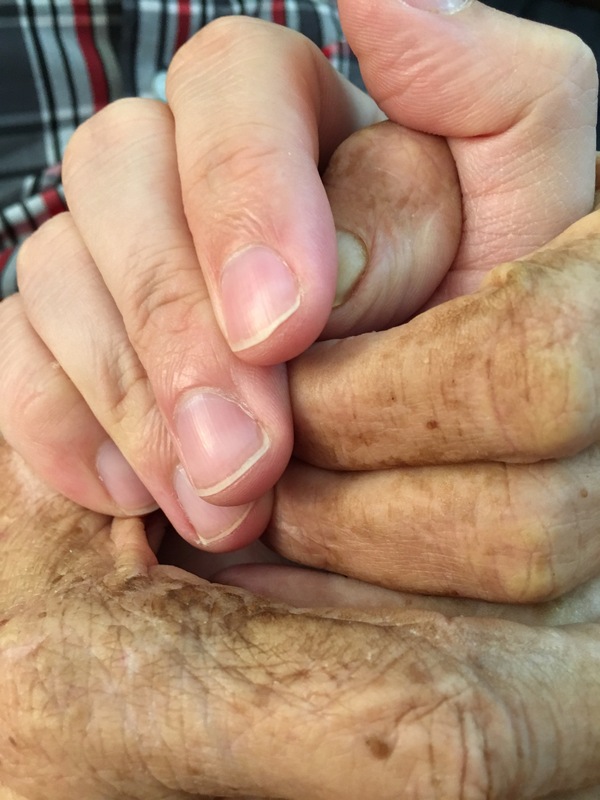 At the same time, Dad’s strength continues to fade. He spends most of his day — I’ll estimate at least 20 hours — sleeping. And that amount seems to be increasing at a brisk pace. Fortunately, we’ve been able to get Hospice in here to help with an adjustable hospital bed, and some medicine to help with the pain and anxiety. This service is free, believe it or not, and includes regular home visits from nurses and aides to help take care of him in his final days. They’ve also confirmed that Dad likely only has a week or two left with us. Though it sounds awful to say out loud (or post online), I have to confess, that’s something of a relief to know. As I said to his wife last night, he’s in pain, and he can’t enjoy his life the way he used to. And he’s never going to be able to again. These final days alternate between suffering and sleep, and frankly, it will be merciful for him when it stops. I’m finishing this post sitting at his bedside. I’m holding his hand, almost by accident; he had reached for help getting up, but didn’t have the energy and ended up falling back asleep, clutching my hand in his. So now, he sleeps, still gripping my hand. When I was younger and scared, or sick, or in pain, he held my hand and told me everything would be okay. He’d sit with me until the pain and fear stopped. He was strong for me when I needed him to be. Now it’s my turn to be strong for him. This entry was posted on Friday, May 13th, 2016 at 9:46 am and is filed under Uncategorized. You can follow any responses to this entry through the RSS 2.0 feed. You can skip to the end and leave a response. Pinging is currently not allowed.